You are currently browsing the tag archive for the ‘The Horticultural Society of New York’ tag. Prunus dulcis, Almond, watercolor by Margaret Best, © 2016, all rights reserved. 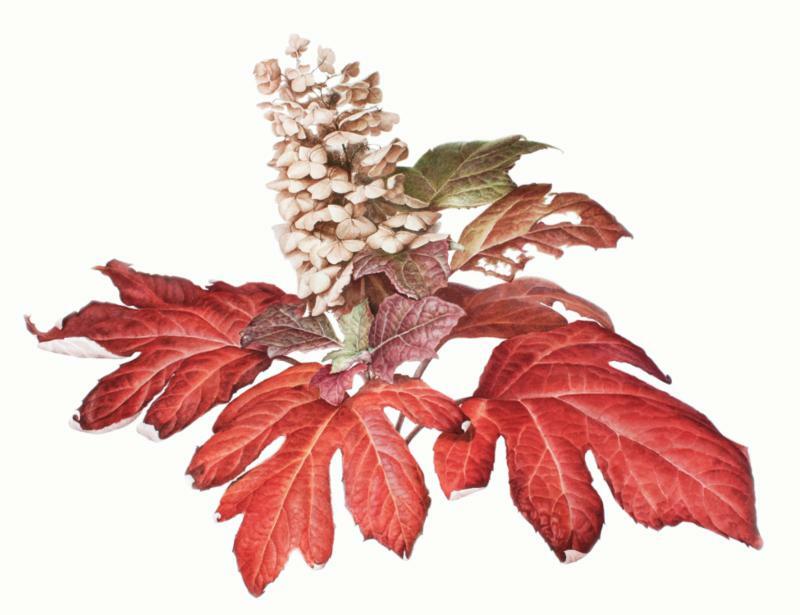 BAGSC members Margaret Best, Akiko Enokido, Asuka Hishiki, Mitsuko Schultz, and Deborah Shaw have been accepted into the 19th Annual International American Society of Botanical Artists (ASBA) and The Horticultural Society of New York. Jurors Susan Fraser (Director, Mertz Library,The New York Botanical Garden), David Horak (Curator of the Aquatic House, Brooklyn Botanic Garden), and Catherine Watters (Botanical Artist) chose 48 artworks from 258 submissions. Works in the exhibition include artists from the United States, Australia, Brazil, Canada, Japan, the Netherlands, and the United Kingdom. Camellia japonica ‘Hakuho’, Heirloom Camellia ‘Hakuho’ ‘White Phoenix’, watercolor on vellum by Akiko Enokido, © 2015, all rights reserved. This year’s exhibition is in a new venue: it will be hosted by the New York Design Center and installed in their bright, airy, contemporary gallery space, 1stDibs, on the tenth floor. The Horticultural Society of New York, New York Design Center, and ASBA are designing special outreach events and programs, to be announced in September. The opening reception will take place on Thursday evening, November 3, 2016 and will be on display through December 30, 2016. The catalog of artwork images will be posted on ASBA’s website the day of the opening. 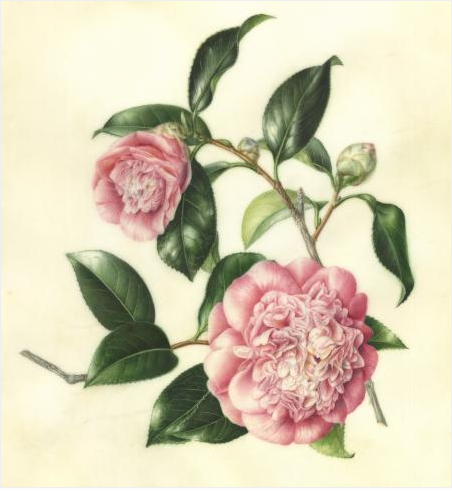 A full-color catalog will be published and available on ASBA’s website, as well as at the 1stDibs Gallery and at The Horticultural Society of New York. For further information please contact ASBA’s Exhibitions Director. 1stDibs is located on the 10th Floor of The New York Design Center, 200 Lexington Avenue, New York, New York, 10018. Gallery Hours are 9:30 – 5:30 Monday – Friday. Solanum lycopersicm, Dancing Duo 34-A, Portrait of an Heirloom Tomato, watercolor by Asuka Hishiki, © 2016, all rights reserved. Hibiscus rosa-sinensis, Hibiscus, watercolor by Mitsuko Schultz, © 2016, all rights reserved. Opuntia spp. Fruit, Tunas or Prickly Pear Cactus Fruit, watercolor on vellum by Deborah Shaw, © 2016, all rights reserved. 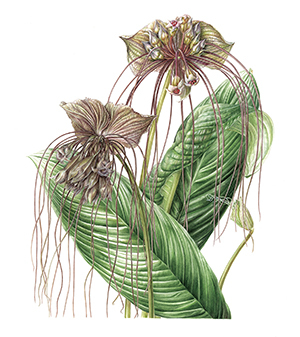 BAGSC members Margaret Best and Melanie Campbell-Carter have been accepted into the 18th Annual International American Society of Botanical Artists at The Horticultural Society of New York. 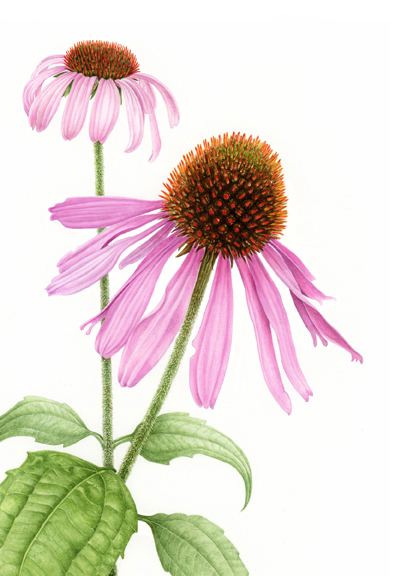 Margaret Best, Echinacea purpurea or purple cone flower, © 2015, All rights reserved. Melanie Campbell-Carter, colored pencil, Pseudobombax ellipticum, shaving brush tree, © 2015, all rights reserved. Are there any more BAGSC artists who have been accepted? If so, please send me an email with an image. 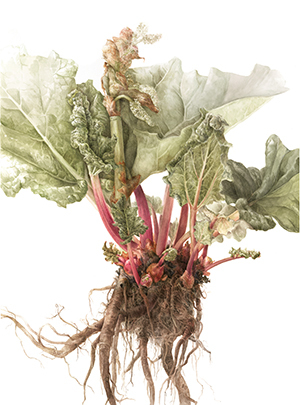 Each fall, the Annual International American Society of Botanical Artists at The Horticultural Society of New York exhibition is held at the Hort in mid-town Manhattan. It is the ASBA’s longest running collaboration. Past exhibitions are posted on the ASBA’s website; this year’s exhibition will be posted as well. The Hort’s Gallery encourages gardeners and artists alike to appreciate the creative intersection between art and nature. Exhibitions showcase emerging and established contemporary artists inspired by horticulture, botany, landscape, and the environment. 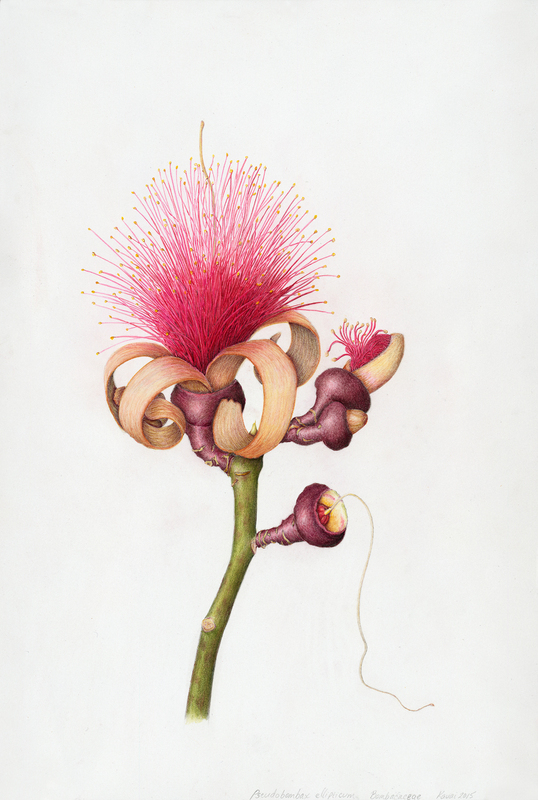 The American Society of Botanical Artist’s (ASBA) contemporary botanical art show, entitled “Weird, Wild, & Wonderful” will open on Wednesday, April 16, 2014 in the Arthur and Janet Ross Gallery at The New York Botanical Garden (NYBG). The exhibition will be on display to the public from April 19 – September 21, 2014, and admission is included in any all-garden pass. The Second New York Botanical Garden Triennial invited artists to seek visually unusual plants and create works of art that celebrate the bizarre, yet beautiful flora of the world. Jurors Lugene Bruno, Curator of Art, Hunt Institute; Jean Emmons, Botanical Artist; and Marc Hachadourian, Manager of the Nolen Greenhouses, NYBG, pored over the 240 entries, selecting 46 artworks by 45 artists from the United States, Australia, Canada, India, Japan and the United Kingdom. Shirley Sherwood, D. Phil, Caroline A. Wamsler, Ph.D., and Jean Emmons form the Awards Jury, which will meet on April 16 to select recipients of The New York Botanical Garden Gold, Silver, and Bronze Medals. Recipients of The New York Botanical Garden Medals will be presented by NYBG CEO Gregory Long at the opening reception. More information about the exhibition, including the complete list of accepted artists can be found on the ASBA website. The exhibition catalog is available in The New York Botanical Garden’s shop in the garden, or online from ArtPlantae. ASBA members receive a discount on the catalog. Five BAGSC members had works accepted into the “Weird, Wild, & Wonderful” exhibition: Margaret Best, Akiko Enokio, Joan Keesey, Lisa Pompelli, and Deborah Shaw. Margaret Best, Tillandsia bulbosa, watercolor. © 2014, all rights reserved. 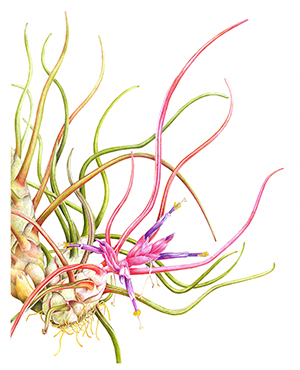 Margaret Best had her watercolor of Tillandsia bulbosa accepted. Margaret wrote that she wanted to send thanks to Leslie Walker, Debbie Friedman and Deborah Shaw for helping her access Jeffrey Kent’s incredible Bromeliad collection near San Diego, where she discovered this remarkable specimen. This was one of the few paintings of Margaret’s that was not destroyed in the Calgary flood last June, which makes the painting as weird, wild, and wonderful as the subject matter. Akiko Enokido, Tacca chantrieri, watercolor. © 2014, all rights reserved. 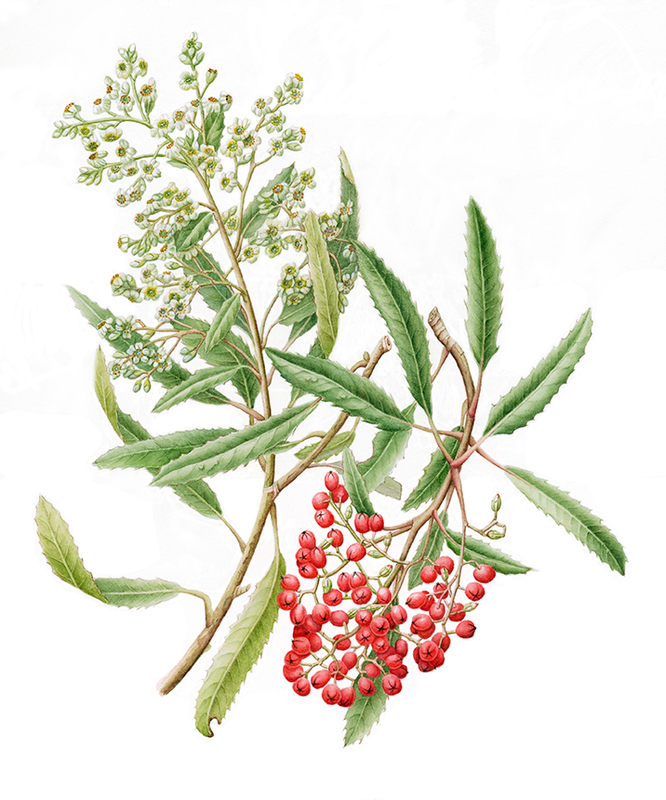 Joan Keesey, Sarcodes sanguinea, watercolor. © 2014, all rights reserved. 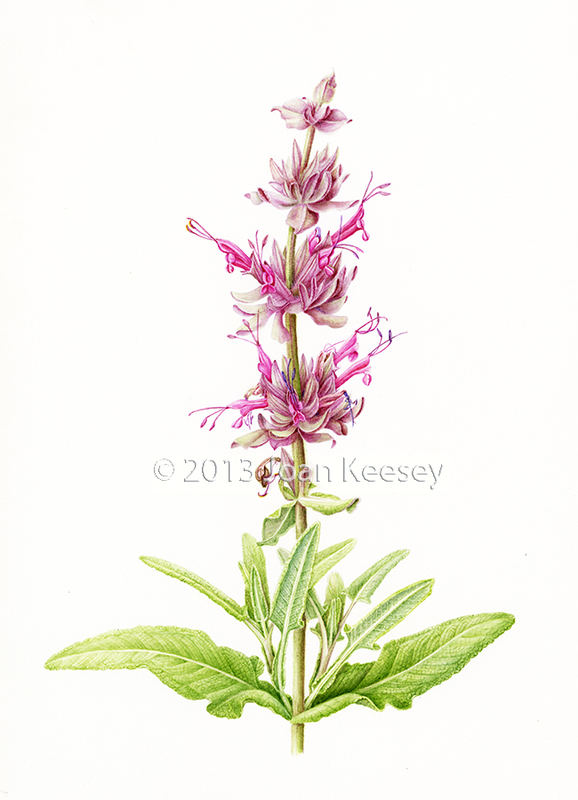 Joan Keesey painted a watercolor of Sarcodes sanguinea, the Snow Plant. The Snow Plant, native to Western North America, and found from Oregon through California into Baja California, and is one of the first plants to appear in the Sierra Nevada in early spring just after the snow has melted. Because the landscape is still wintery and bleak, the Snow Plant is a real treat to find. The brilliant red color is quite shocking and unexpected. The botanical name, Sarcodes sanguinea, means bloody flesh. A really good fresh plant can look almost manufactured like a toy made out of bright red, red-orange, or rose-colored plastic. Joan writes that the Snow Plant is a member of the Heath Family (Ericaceae) and a mycotrophic (fungus eating) plant. It is unable to photosynthesize and is a parasitic plant that derives sustenance from mycorrhizal fungi that attach to the roots of trees. The Snow Plant does not, however, kill the fungi. They have a symbiotic relationship; the Snow Plant provides fixed carbon to the fungus, and in return the fungus provides mineral nutrients, water, and protection from pathogens. The Snow Plant takes advantage of this mutualism by tapping into the network and stealing sugars from the tree, the photosynthetic partner, by way of the fungus. 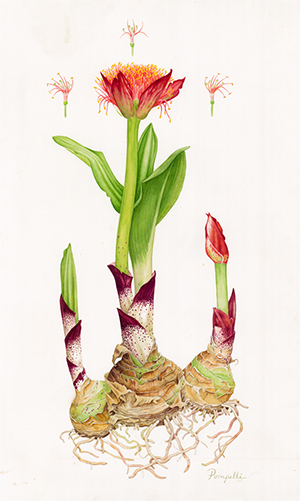 Lisa Pompelli, Scadoxus puniceus, watercolor, © 2014, all rights reserved. 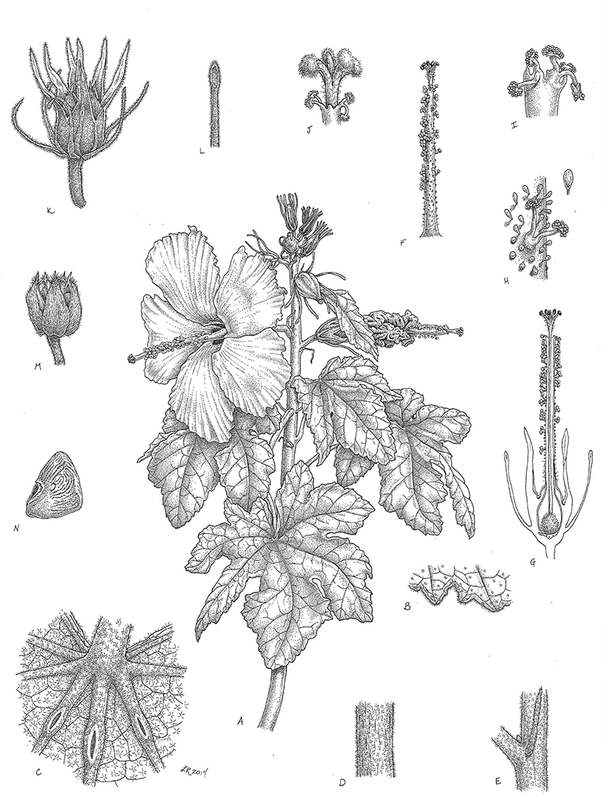 Deborah Shaw, Pisolithus tinctorius, watercolor. © 2014, all rights reserved. 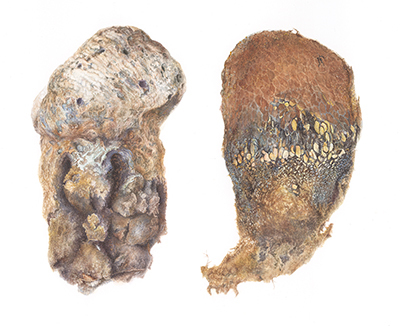 Deborah Shaw painted a watercolor of Pisolithus tinctorius, also know as the Dog Turd Fungus, Dead Man’s Foot, or Dyemaker’s Puffball. Pisolithus tinctorius is frequently described in the literature as the least attractive of all fungi. P. tinctorius starts out as a ball shape when young, but then grows into bizarre monstrous shapes like stumps or giant molars. It is an ectomycorrhizal fungus that gets its nutrition in a mutualistic association with tree roots—an association that helps trees access scarce nutrients such as nitrogen and phosphate. It inhabits poor and disturbed soils, can withstand drought, high temperatures in the summer, acidic soils and soils contaminated with heavy metals and mine tailings. It is so beneficial to tree growth it is widely used in reforestation projects. Congratulations to all! Weird, Wild & Wonderful promises to be an exciting show! BAGSC members Akiko Enokido and Mitsuko Schultz have been accepted into the 16th Annual International American Society of Botanical Artists at The Horticultural Society of New York. Congratulations to both of you! Since ancient times, Cherry blossoms in Spring and Chrysanthemum in Fall are both loved by the Japanese people. 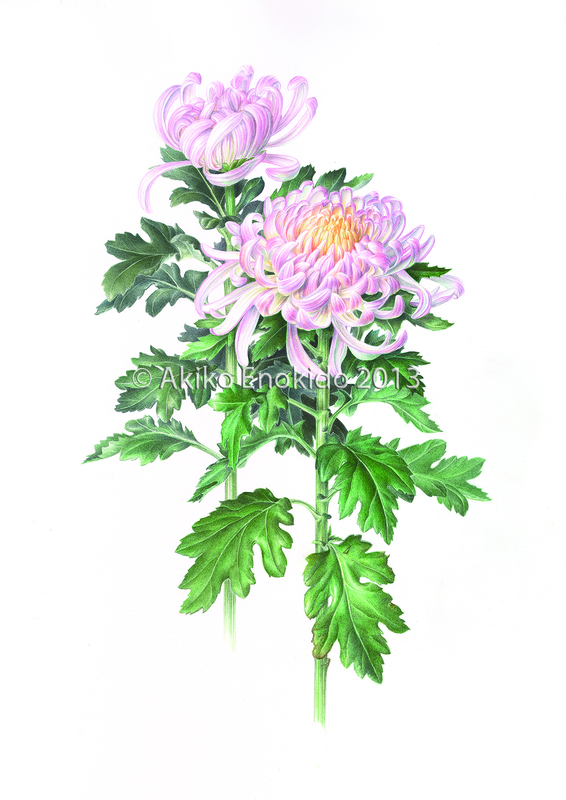 The chrysanthemum enthusiasts put a lot of effort to make straight stems and big beautiful flowers on each of the stems. Flower exhibitions are held all over Japan during the season. We not only enjoy them for viewing but also for their taste in salads or tea. I found this particular one in my neighborhood. The flower is not good shaped to show in exhibitions, but I was fascinated by its energy to grow. This will be a memorable piece. My first painting in Japan. 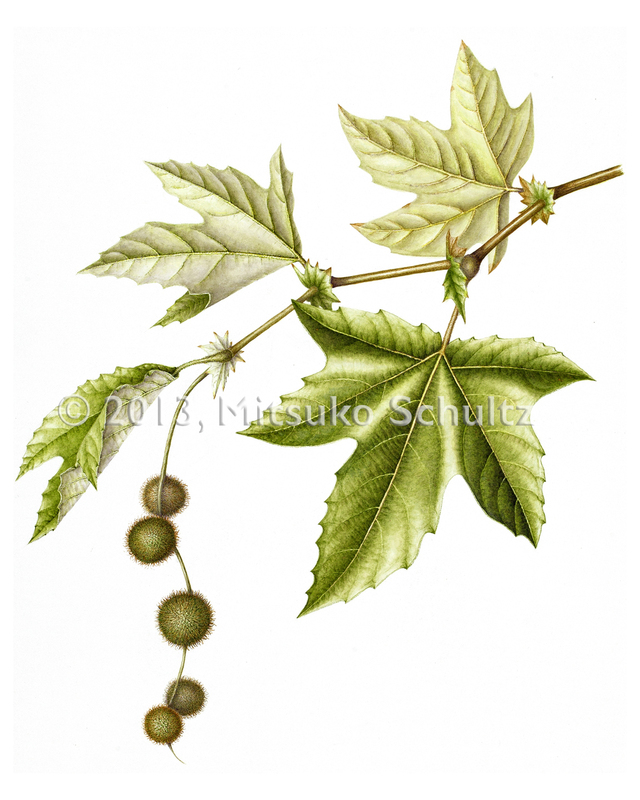 “Plantanus racemosa,” California Sycamore, Watercolor by Mitsuko Schultz, © 2013, all rights reserved. This is my first time to be accepted to the ASBA Horticulture show and I am so happy and excited. I have been studying watercolor with Akiko Enokido since July 2011 and she helped me immensely and has given me a lot of encouragement. While painting this sycamore piece, Akiko continued to offer advice and encouragement even though she had returned to Japan. Thank goodness for email! We’ve added several new categories to the blog: one of them is a Kudos! section, to announce great things that happen to our members. 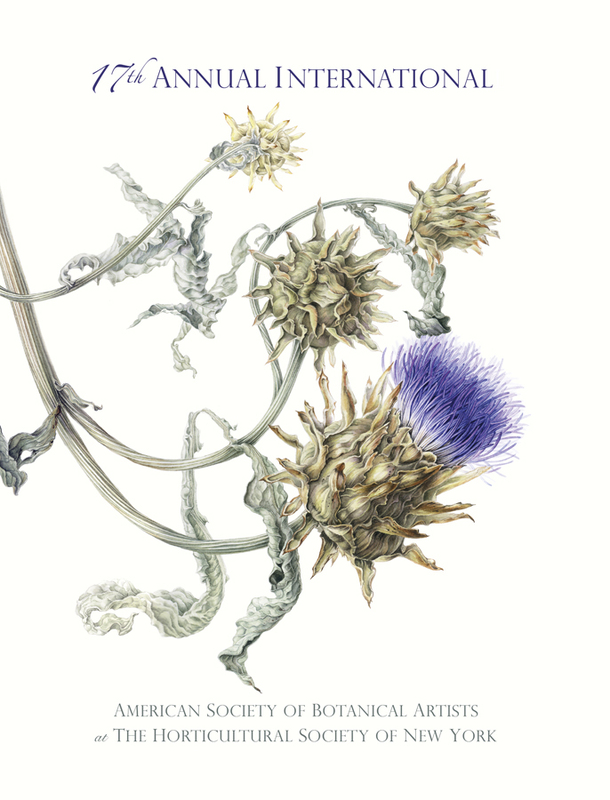 Kudos to BAGSC members Margaret Best and Akiko Enokido: both were selected to exhibit in the 15th Annual International exhibition for the American Society of Botanical Artists at The Horticultural Society of New York. And both sold their paintings in the show! Congrats! Do you have an announcement, or would like to say Kudos! to another BAGSC member? If so, send your information to Deb Shaw, and she’ll make sure it’s posted. 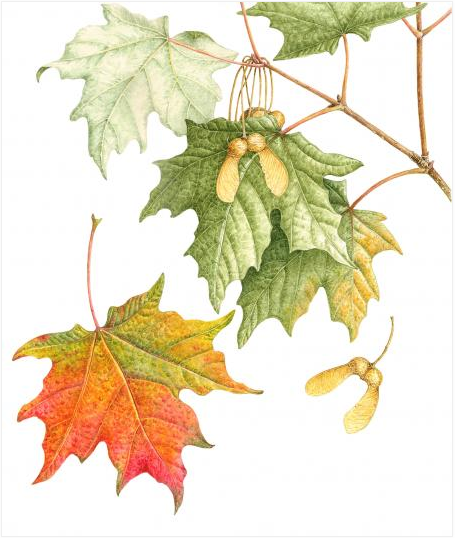 Acer saccharum, Sugar Maple, by Margaret Best, watercolor on paper, © 2012, all rights reserved. 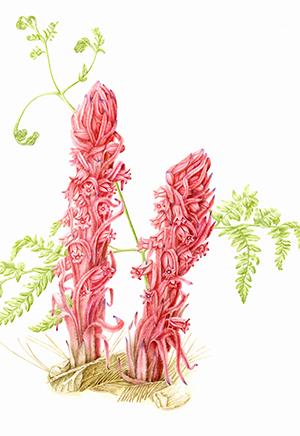 BAGSC members Margaret Best and Akiko Enokido were selected to exhibit in the 15th Annual International exhibition for the American Society of Botanical Artists at The Horticultural Society of New York. The show is comprised of forty-three artworks by thirty-nine different artists from the US, Australia, Brazil, Canada, Japan and the UK. Jurors Patricia Jonas, Kathie Miranda and Derek Norman had the difficult task of selecting from 192 entries. The artwork in the show can be viewed in the exhibition section on the new ASBA website. Be sure to read interviews with Margaret and Akiko about their work in the show on the website as well. Camellia japonica ‘Chandleri Elegans’, Variegated Camellia, by Akiko Enokido, watercolor on vellum, © 2012, all rights reserved. Want a catalog of the exhibition? Order from ArtPlantae for $20. The exhibition will be on display from September 14 – November 21, 2012 at The Horticultural Society of New York, 148 W. 37th Street, 13th Floor, New York, New York, 10018. Gallery hours are Monday – Friday, 10 am to 6 pm.